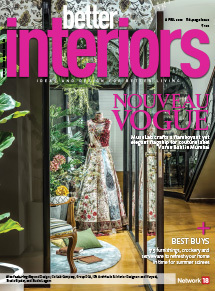 Whether you’re looking to overhaul your bathroom or just upgrade it, look no further than our curated annual round-up of elegant, luxurious and innovative sanitaryware and bath fittings from Indian and international brands that embrace design and technology in equal measure. With the appearance of water-worn stone, the Stonetto shower tray is available in four shades: white, sand and anthracite, and concrete. The shower tray is made from Durasolid Q, a high-grade cast mineral material with a high surface hardness and density that makes it extremely resistant to damage and dirt. The barely visible slope of the tray enables water to drain away swiftly. 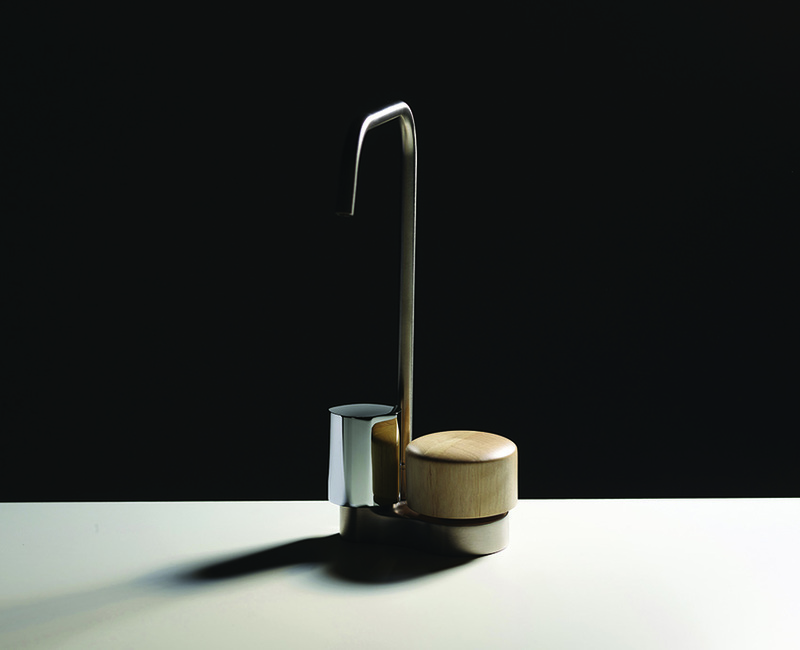 The Spillo Tech faucets are marked by three-dimensional surfaces with a suggestive connection between base and handle. They are (X) Cross, with an elegant and luxurious faceted surface, inspired by the diamond; (V) Vertical, characterized by the geometric rigor of a 19-sided polygon; and (G) Knurled, a micro-diamond effect with an industrial mood. 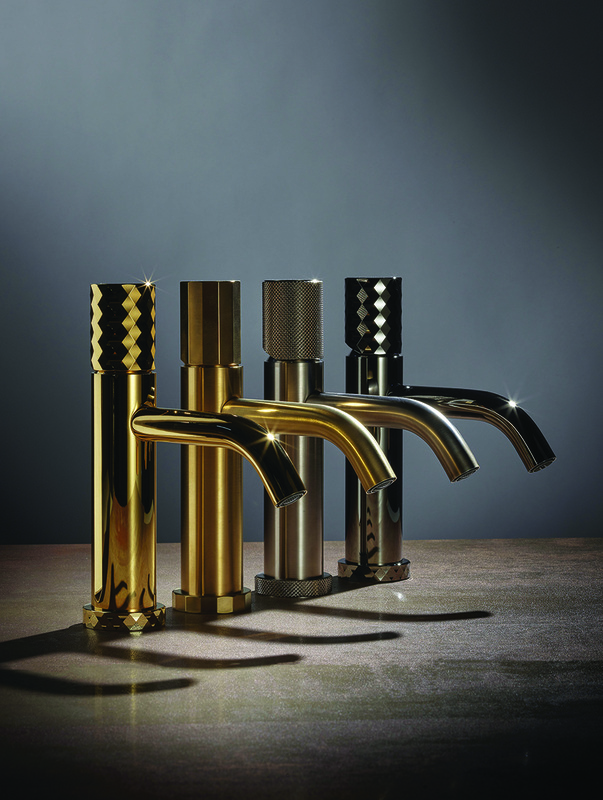 These faucets are offered in chrome, black chrome, brushed nickel, brushed black chrome gold, brushed gold, white matte, and black matte finishes. The two-person Gemini spa comprises stainless steel jets, water features, and a fantastic lighting package. Each side offers a slightly different seating design and jet configuration. Each seating area is contoured for deep soaking, so even the tallest bather can stretch out and enjoy a neck, shoulder, or foot massage. It uses a 2-speed pump and Gecko control system, has with a fibreglass base, an underwater LED light feature and accessories like backlit drink holders, and a chromo cascade grab bar. 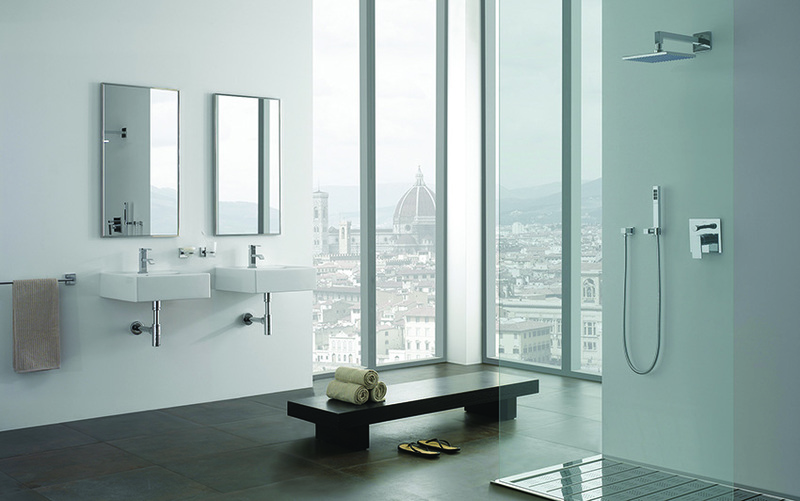 The ShowerHeaven 1200 has been developed in collaboration with Stuttgart-based Phoenix Design. 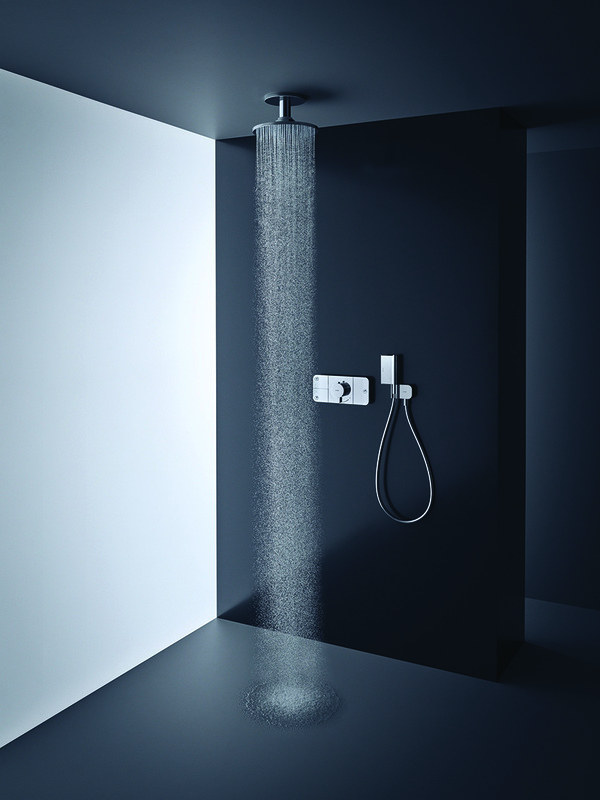 The overhead shower comes with a 1.2-metre long and 30-centimetre wide plane surface of high-quality metal. It is designed with four retractable wings and integrated ambient lighting along with three jet types: a concentrated mono jet in the middle, the expansive rain jet, and body jets with their unique PowderRain spray. 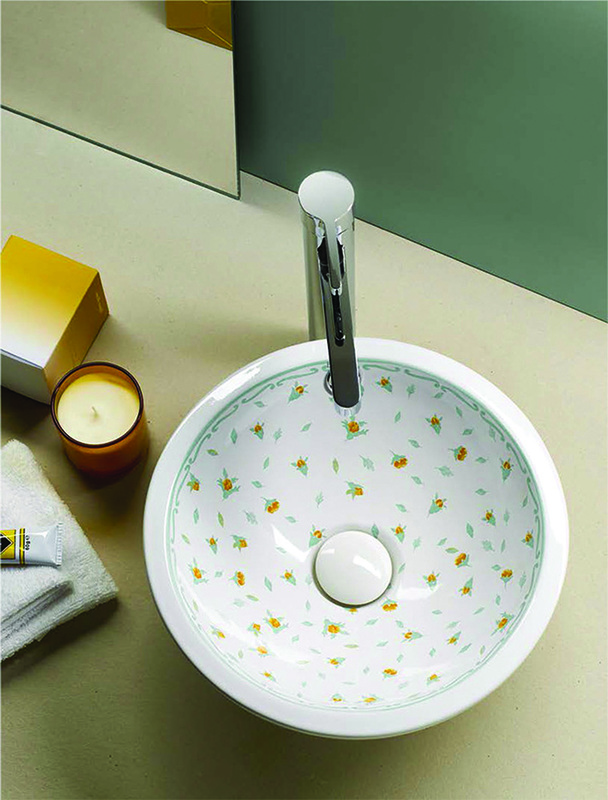 The lovely Flor de Lys basin is part of Spain-based brand Bathco’s Vintage & More collection. Traditionally the fleur-de-lis has been considered an emblem of divinity. In reality, its apparent simplicity has a special beauty to it which has been intricately captured in this handmade porcelain washbasin. Water, light, energy — Aquamoon represents a new dimension of a highly-individual shower experience. The spa application embodies the next level in the Dornbracht LifeSpa and comes with four newly-developed flow modes and fascinating lighting scenarios. It has a minimalist design — a dome in the ceiling forms the central element which is seamlessly integrated in its surroundings and practically merges invisibly with the bathroom or spa interior. By means of a concealed light strip inside the semi-sphere, Aquamoon creates the perfect mood lighting while generating a feeling of infiniteness when gazing upwards. With its smooth cylindrical body and crisp rectangular handle and spout, the Lineare single-lever basin mixer will look perfect in any modern bathroom. 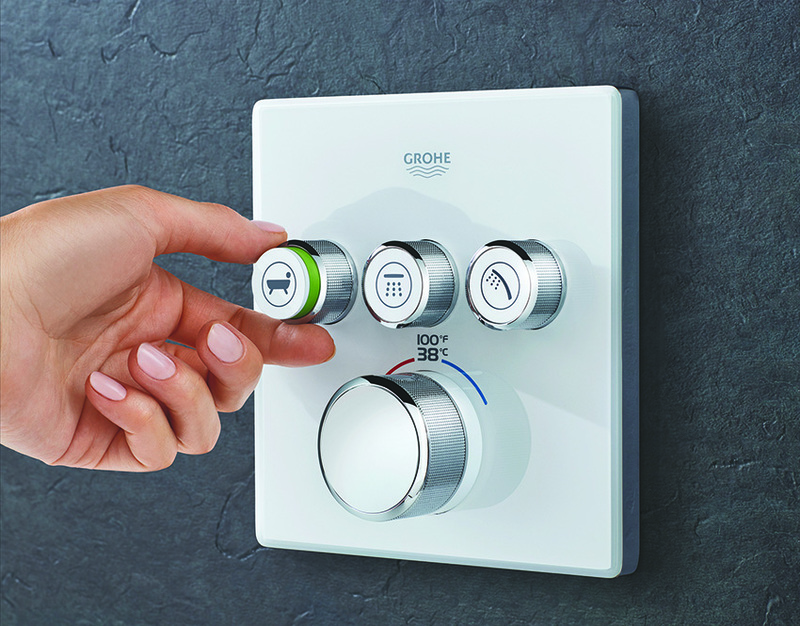 It comes with a ceramic cartridge that enables smooth and precise control of water volume and temperature, and Grohe SilkMove ES technology that saves energy as only cold water runs through when the lever is in a central position. Eccentrico from Italian company Falper is designed by Victor Vasilev and is a free standing washbasin. It has a rational design, which enhances the geometry of the circle by declining it into a totemic element to create a simple and refined dialogue between the different materials of Carrara marble, wood, metal and Cristalplant. The Memoria Black series features an open shelf unit, drawers, a cabinet, an anti-fog mirror and a magnifier. The open shelf unit is a combination of patterned oak and matte black, and smoothly revolves on its hinges to reveal a mirror at the back. Wide, full extension drawers offer ease of use and ample storage space. Kludi Pure&Easy is part of the Pure Function series and would impress those who like things fashionable and straightforward. 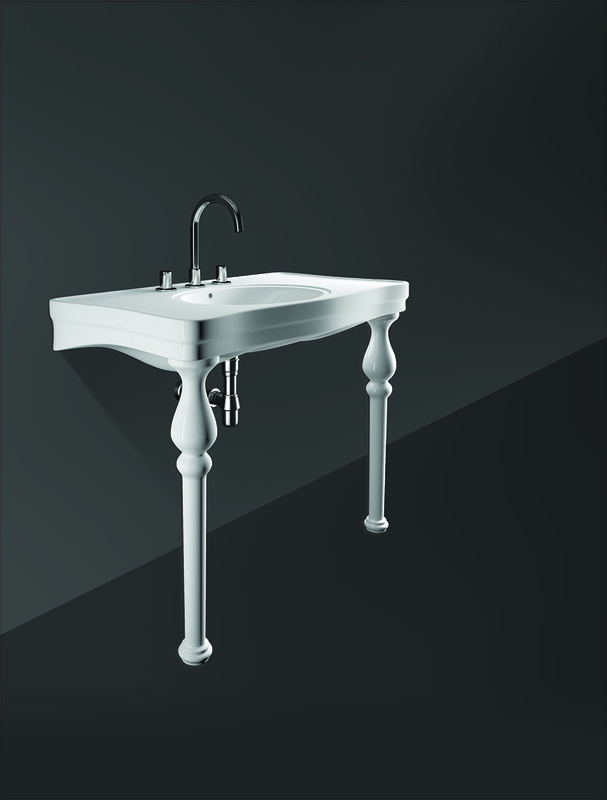 The dynamic tilt of the washbasin fitting and the gentle transition between the lever head and shaft look young and modern. The combination of the angled fitting body and the straight lever is unique. The single lever mixers are available with a glossy chrome or an elegant white surface finish. 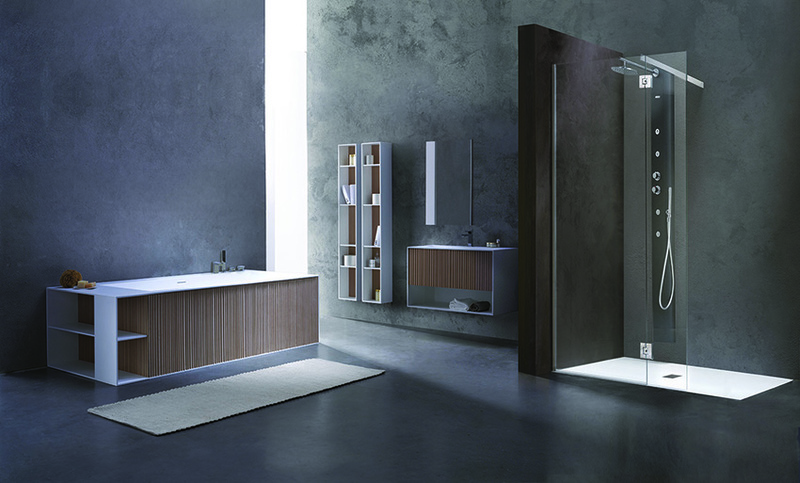 The Brioso bathroom furniture range designed by Christian Werner represents relaxation and freshness in a contemporary bathroom interior. Its distinctive features include precise, finely nuanced geometry produced by slender cabinet frames that form the edges of the furniture, mirrors, and mirror cabinets. The semi-tall cabinet and vanity unit in white matte with tone-in-tone handles and feet make for a highly appealing continuation of the gleaming white ceramics. Alchymi, the super-premium brand by HSIL, curated by Manish Malhotra, has recently unveiled Poise, a new bathroom suite. 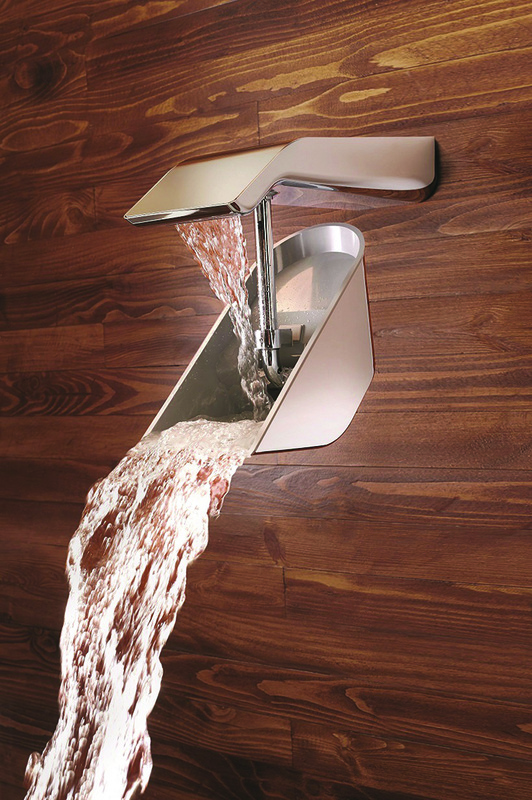 It is inspired by iconic architecture, sharp edges and geometric design, and comes with wall-mounted WCs, wash basins, faucets, showers and a bath spout. The floor-standing, single lever mixers for wash basins and bath tubs from the Metropol series make impressive design statements in a bathroom. Made of brass with a chrome colour, they have a ceramic cartridge, a 235-milimetre long spout, and an integrated shower support. 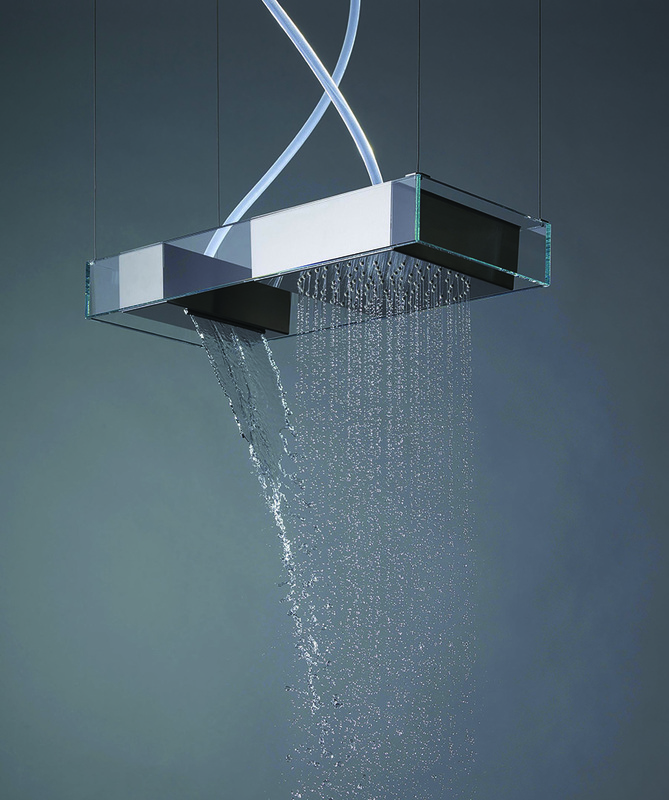 Bathing from a bucket overhead has inspired the design of the TumbleRain shower from Artize. The automated tumbling feature lets the high mounted bucket fill on its own every few seconds. One can simply set the water temperature to their preference and use the diverter’s on and off controls as the bucket empties itself. The ceramic over-the-counter basin Oro from the F-Courbe range resembles a coiled paper ribbon that acts more as a boundary confining water than as an actual basin. It is available in dimensions of 44cm x 44cm x 17cm. Another variant of the same is called Argento and is made in dimensions of 56cm x 42cm x 17cm. Visualized by UK-based product designer Ross Lovegrove, the fluid and sophisticated Istanbul series comprises a sink cupboard, Infinit sink, illuminated mirror, urinals, washbasin and fixtures. The elegant designs from the series come in three lacquered colour options: burgundy high gloss, white and olive green. Designed by Kurt Merki Jr, the elegant XSquare furniture range is specially attuned to the design of the contemporary DuraSquare washbasins. The XSquare console vanity unit is in a white satin matte finish with a console in dark walnut. The handle-free fronts with Tip-On technology subtly highlight its elegance. 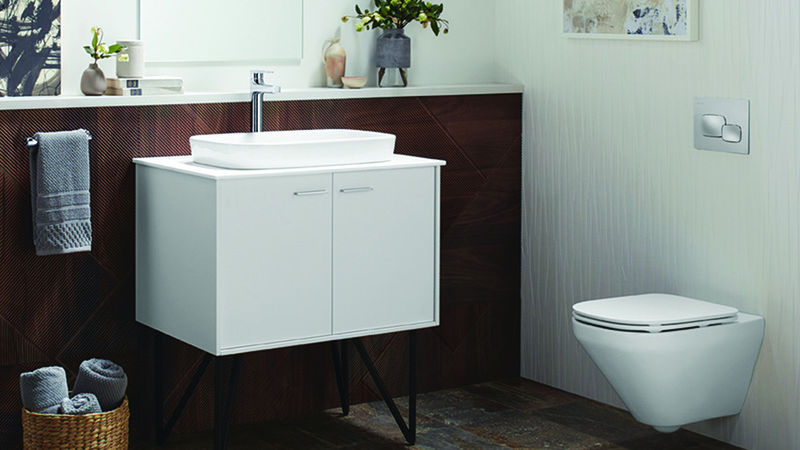 The pentagon and hexagon are harmoniously united for the WC and bidet from the Pent collection, creating a tasteful atmosphere that both stimulates and soothes the senses. They have a rounded shape and are made of Sani Quartz, a Sternhagen-patented high-tech quartz material that has a unique silk matte finish. ModernLife collection features simple, clean lines and seamless curves that provide a superior blend of comfort and convenience. 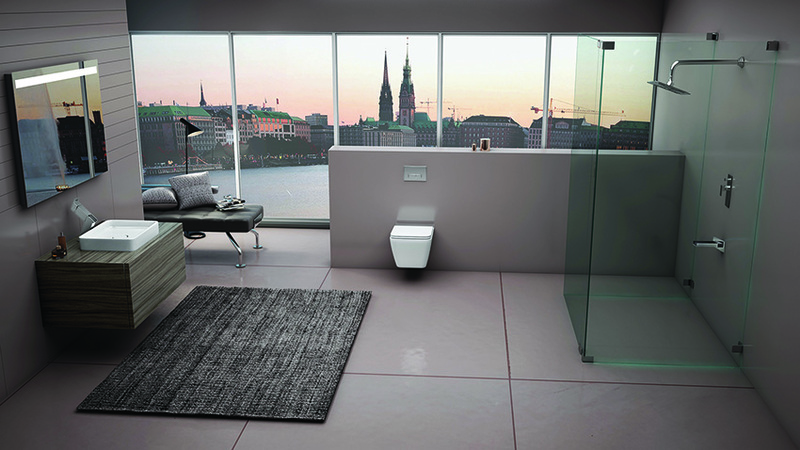 The wall hung water closet has a rimless bowl which ensures no hidden dirt traps, no stains and easy cleaning. 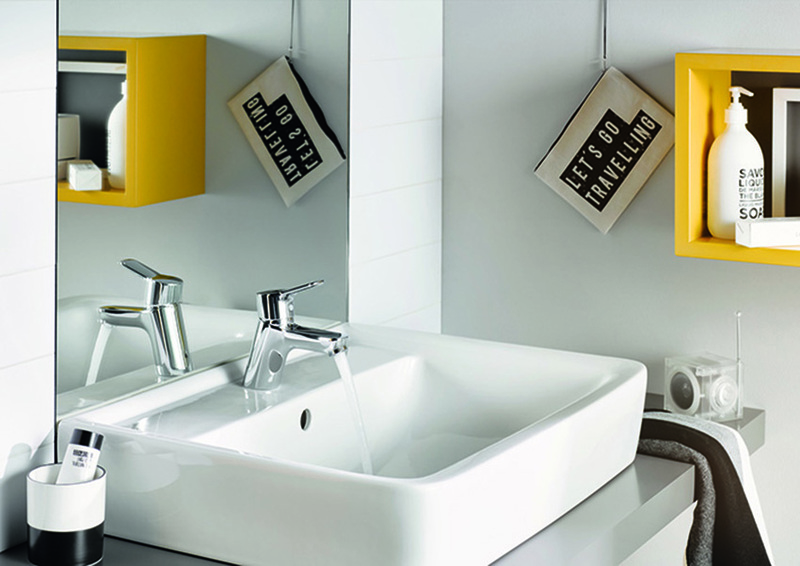 The basins comes with a DFI stain-resistant coating which makes them remarkably easy to clean and maintain. They are available in two variants to suit your design needs — with or without a tap deck. 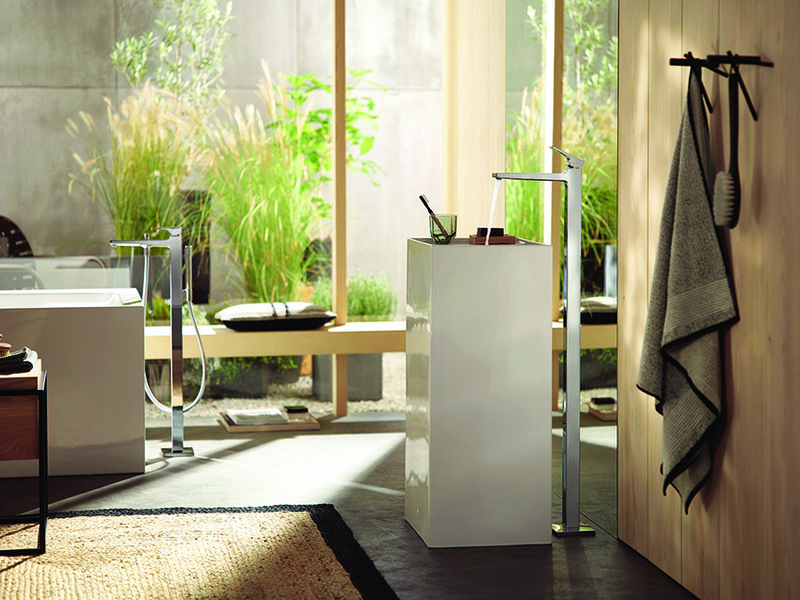 Lauren offers a full range of three-hole articles for the washbasin, the bathtub and the shower area. 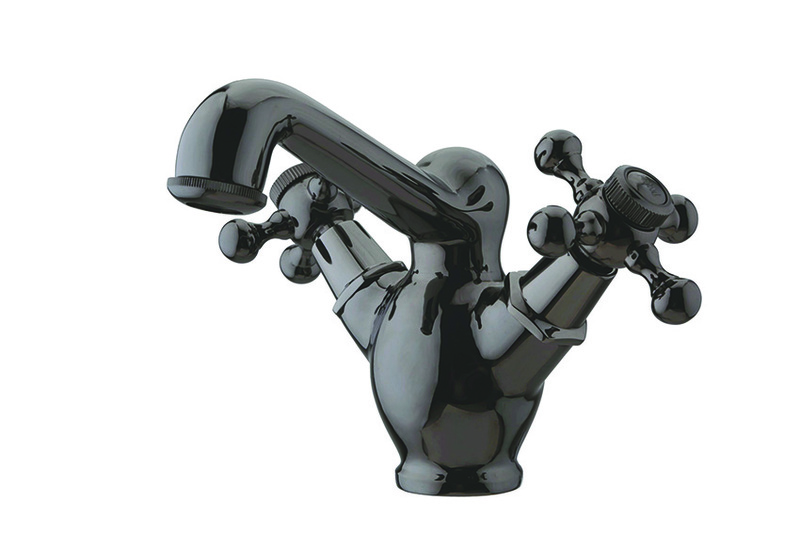 The elements are both deck-mounted and wall-mounted and characterized by sinuous lines and a stately spout. The gentle curve of the faucet and the slim perfectly-appointed handles can take on a stronger look when shown in the gold-plated finish. 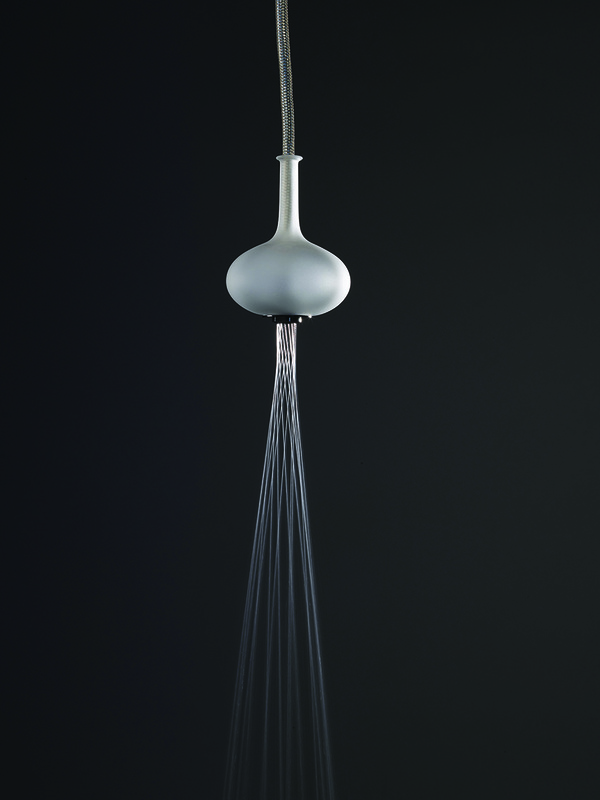 Melograno is a new showerhead designed by the brand in collaboration with Melogranoblu, an indoor lighting company. It is crafted from 10 blown-glass spheres, with a satin or metallic surface, suspended at different heights through silicone tubes and covered by an elegant steel mesh. They are connected to the ceiling by a disc, with a diameter of 50cm and a thickness of 4cm, that supplies both water and light. The Axor One hand-held shower is designed by the London-based design duo Barber & Osgerby. It comes with two sprays and a high-quality metal body with a fully integrated handle that is positioned vertically in the porter unit of the shower rod. A 90-degree turn of the retaining element allows for a selective neck or head massage with the revitalizing waterfall spray option. 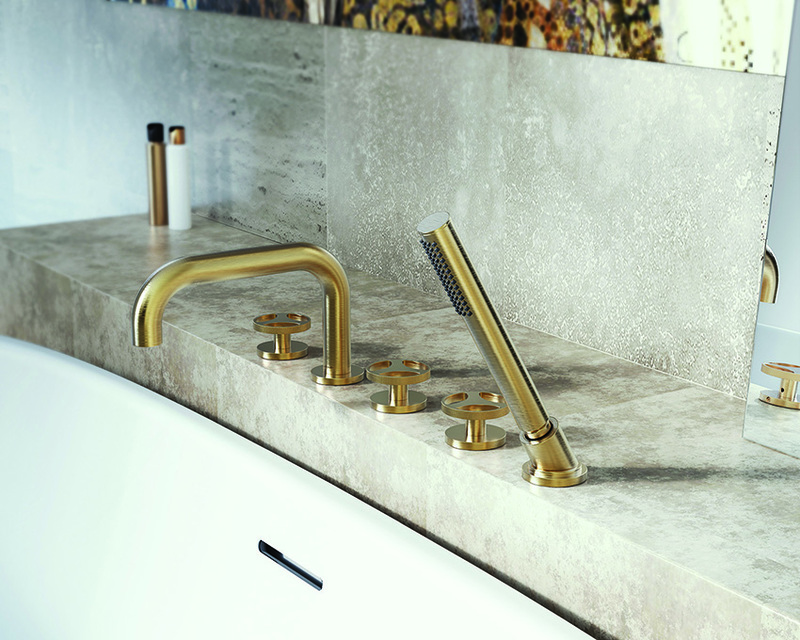 The Incanto Floor-Mounted Tub Filler (made from solid brass) is durable and luxurious. Complete with a slim hand shower and a 59-inch flexible metal hose, this tub filler is perfect for the modern soaking tub. It is available in four finishes: brushed 18k gold plated, polished nickel, brushed nickel and olive bronze. 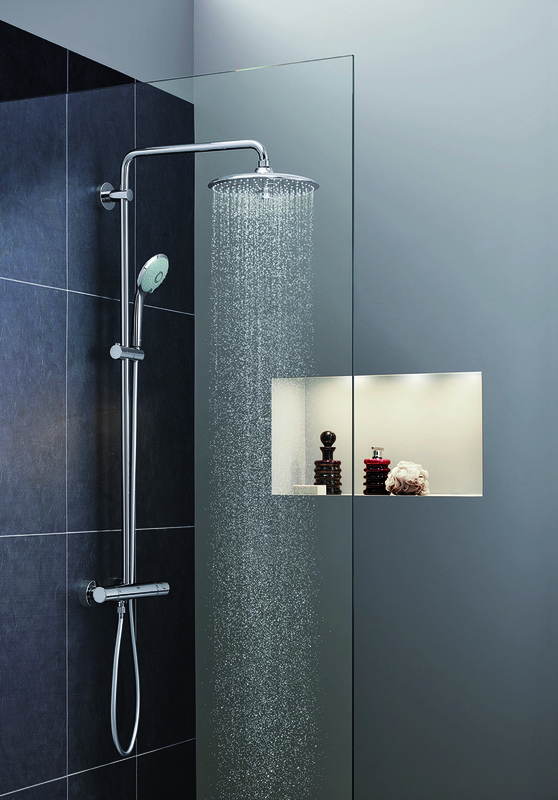 The Raindance E wall-mounted shower pipe and shower tablet 600 consists of an overhead shower, hand shower, shower thermostat, shower hose and shower holder. Some of its interesting features include a 90-degree position-adjustable slider, a chrome-plated spray face, a safety stop at 40°C and QuickClean technology for easy limescale removal. Swarovski is today a worldwide leader and an example of a perfect marriage between a product of nature and the work of an artisan. 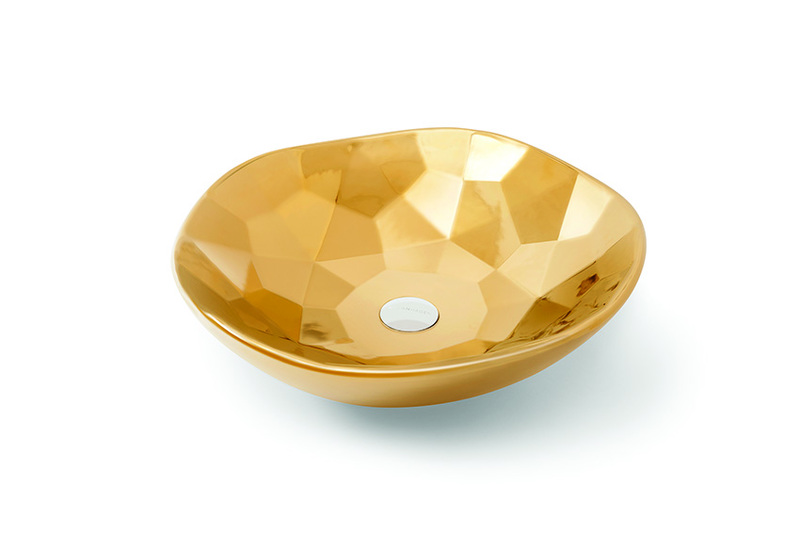 This washbasin in porcelain is an ode to the brilliance of Swarovski and is part of an exclusive collection from Bathco. 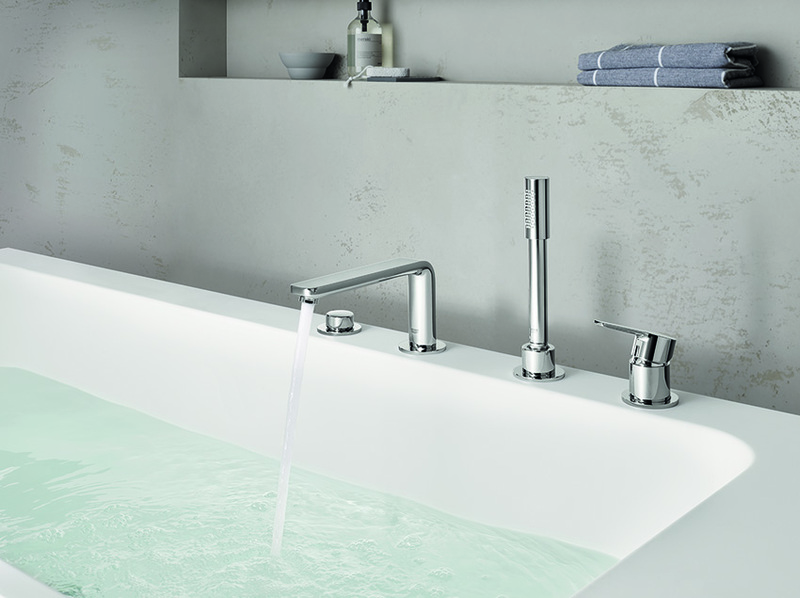 The design of the Axor Uno range of mixers for wash basins, showers and bath tubs is defined by consistent construction where two precisely shaped cylinders are joined together at a right angle. The flow of water can be started or stopped by pressing the Select button, turning the Zero handle, or by lifting the Loop handle. Brushed nickel and polished brass are two of the 15 special finishes available from Axor FinishPlus. Designed by Davide Vercelli, the Moove showerhead is made of a rectangular minimalist frame with one or more built-in steel modules. 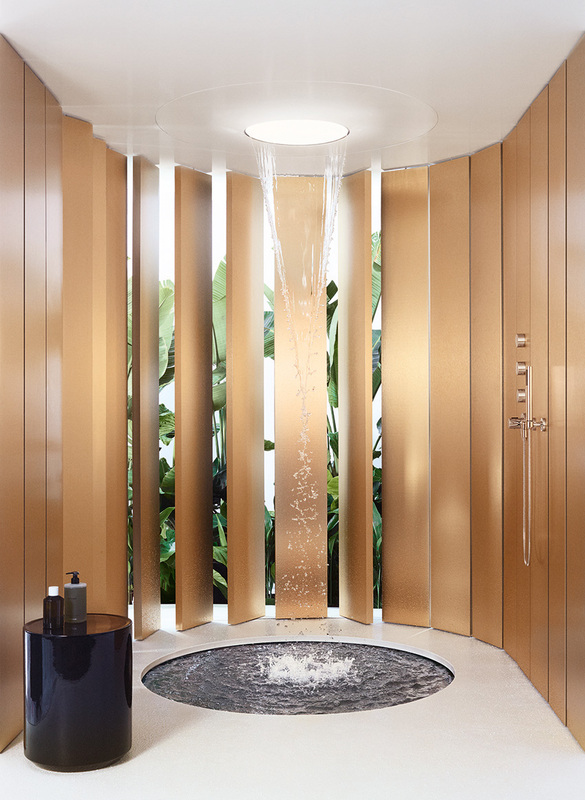 It comes with two different water functions: a traditional rain shower and a waterfall effect. It can be customized as per preference — one can select the installation mode, the module configuration and the finishes of the frame and modules. 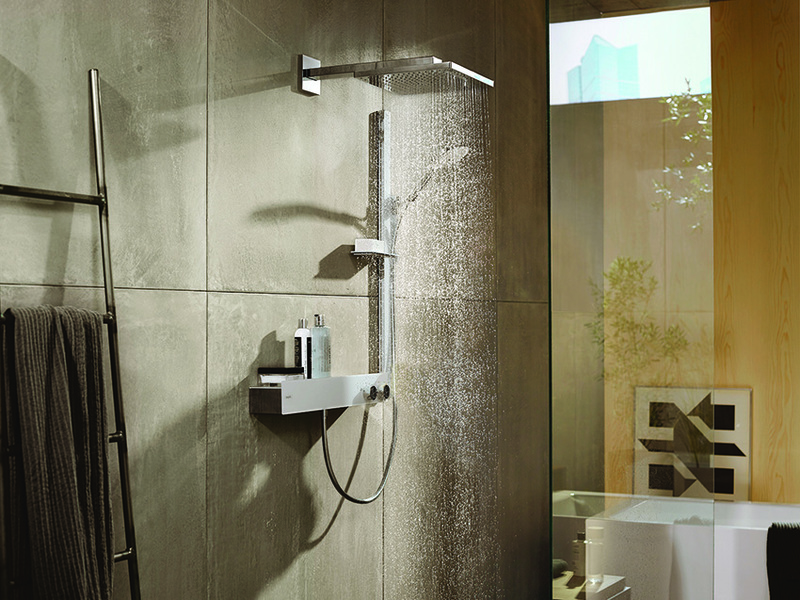 The new Euphoria 260-milimetre head shower features three spray zones: soft, wide rain spray and powerful centre spray. 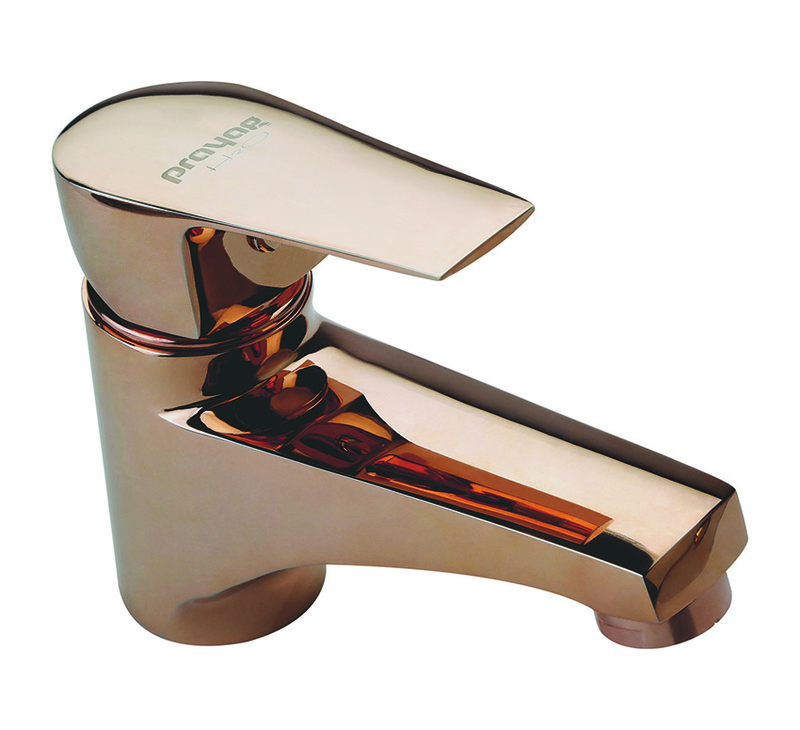 It comes in a slim contemporary design with a chrome plated spray face and standard ball joint. Other notable features include a DropStop function that limits after-dripping when closing the valve and Grohe CoolTouch to prevent scalding. 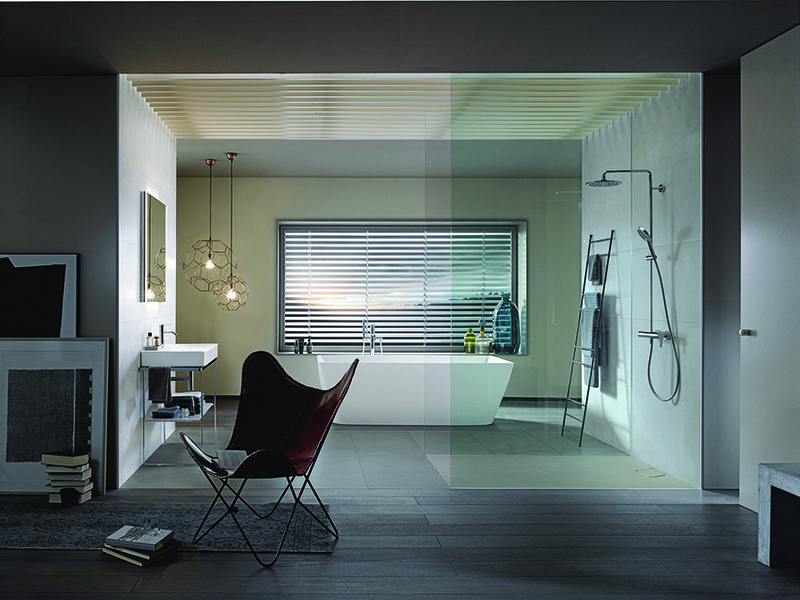 Colors by Kohler is an exquisite range of colours and finishes which infuse new character to bath spaces. 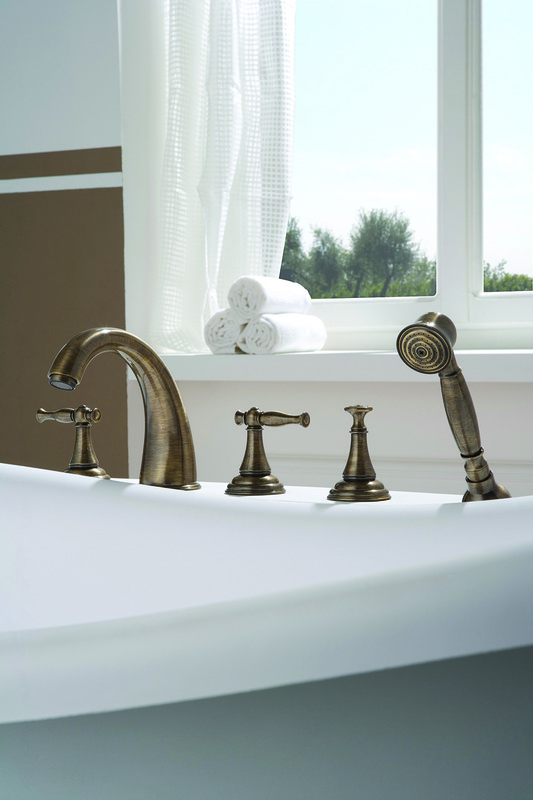 Faucet finishes include hues like Rose Gold, French Gold, Brushed Nickel and Brushed Bronze; while ceramic products come in Almond, Cashmere and Black. Derived from the styling of classic motorcycles, the Harley collection mixes contemporary forms with shapes of the past. The handle is deliberately knurled and the surface ridged to prevent slipping even with wet or soapy hands. The progressive cartridge inside allows control of the flow rate and to move from cold water to mixed water and hot water by simply turning the handle. 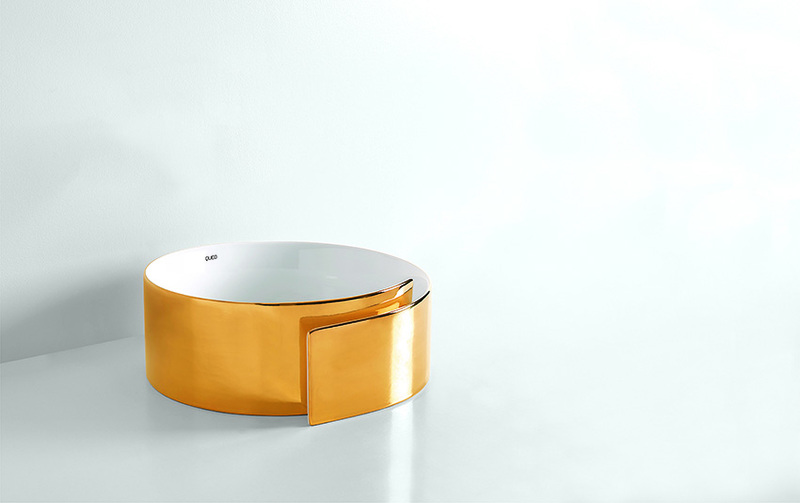 Part of Bathco’s exclusive range comes this washbasin which beautifully captures the noblest of metals, gold, in porcelain. 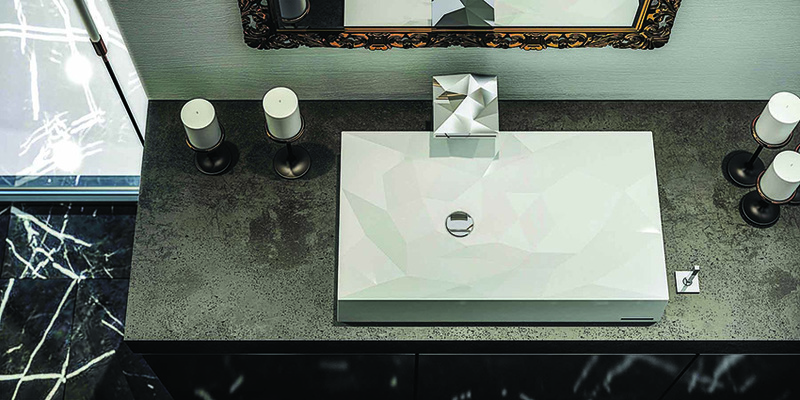 Bathco’s endeavour with this collection is to create washbasins as enduring and far outside fashion trends, just as the golden material from which they take their direct inspiration from — and making a statement wherever they are installed. 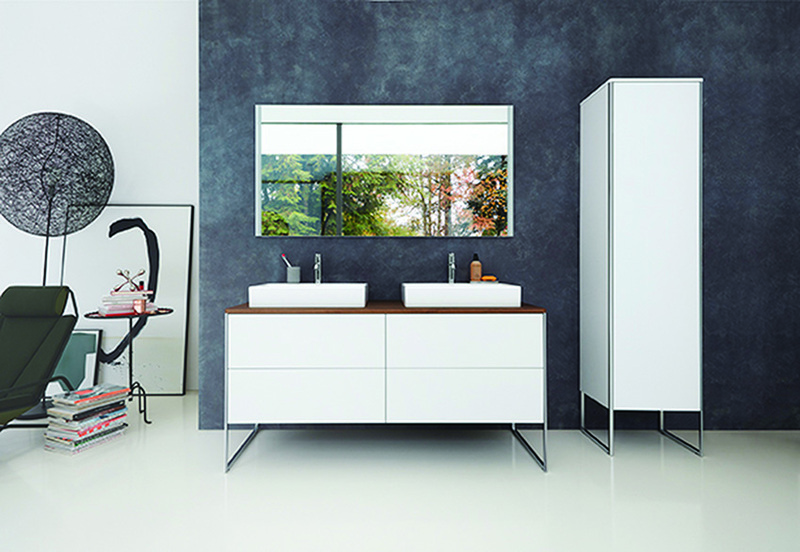 As part of the universal console program, the Brioso range features sanitaryware solutions such as the console vanity unit shown here in the new taupe finish with spacious drawers for storage. 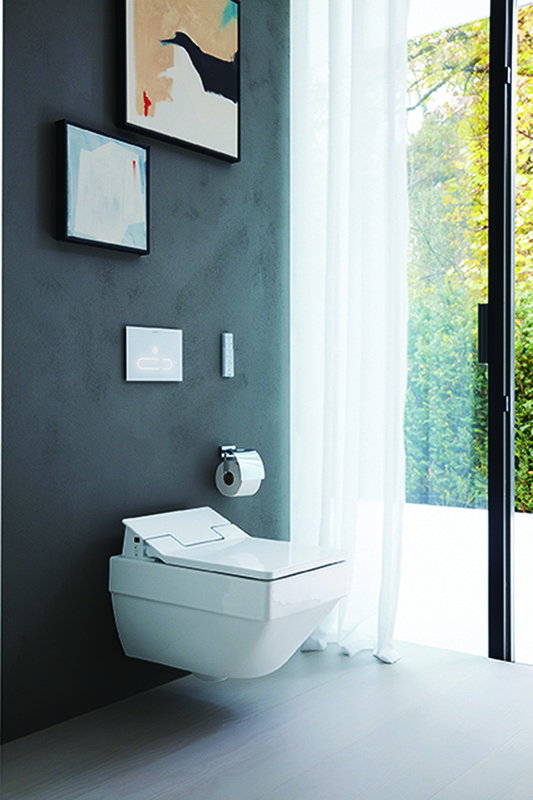 The above-counter basins are from the Vero Air range while the single-lever washbasin mixer is part of the Duravit C.1 tap fitting line. The Tiaara faucet from Artize resembles an extravagant piece of jewellery. The concentric rings evoke the play of echoing ripples of water and the inner ring swings to give access to running water that seamlessly stops without spilling a drop when swung back. It has a solid brass body and a ceramic cartridge. The Homey collection from Falper consists of three elements (bathtub, countertop washbasin and floor-standing washbasin). It is crafted in Cristalplant and each product is available with optional inserts in metallic finish. The metal element becomes the frame that characterizes and embellishes the white canvas, giving life to a product with a sculptural tone. Inspired by the exquisite beauty of a natural crystal, the wash basin and basin mixers from the Kristall range are unique… just like in nature where no two crystals take exactly the same shape. Made of metal with a chrome finish, the basins are available in white and black in dimensions of 715mm x 415mm x 130mm and the mixers come in 140mm x 260mm x 140mm. 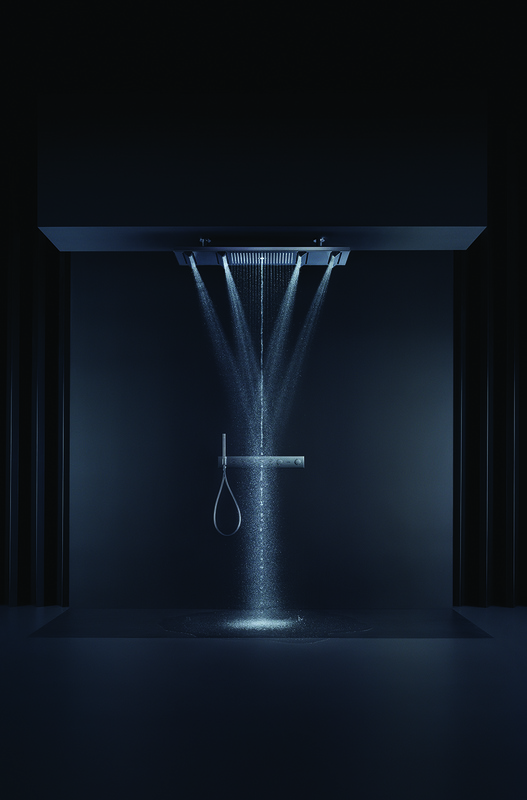 With RainSelect, Hansgrohe is introducing an intuitive and convenient control unit for overhead showers with adjustable spray modes — a panel controls all functions in one unit. Its unique, sleek silhouette, which gives the wall a clean and uncluttered look features quality materials such as metal or glass, depending on the finish, and a metal rim that frames the control panel. Marrakesh is part of the Artist Editions collection and is inspired by Moorish architecture. 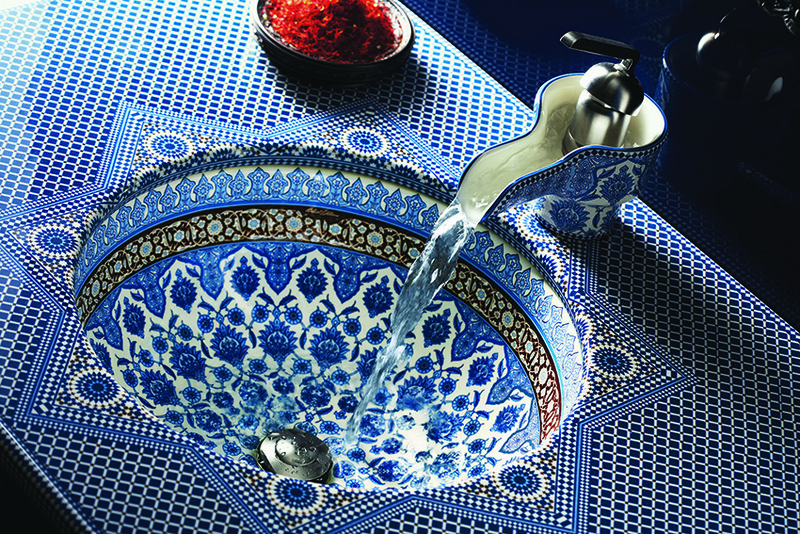 The under-counter basin’s top finds inspiration from mosaics found in a quaint Moroccan courtyard, while the intricate and abstract floral pattern that embellishes the lavatory basin is inspired by artwork found in mosques. The basin is crafted out of durable vitreous china while the antique apothecary mortar and pestle faucet is made from ceramic. 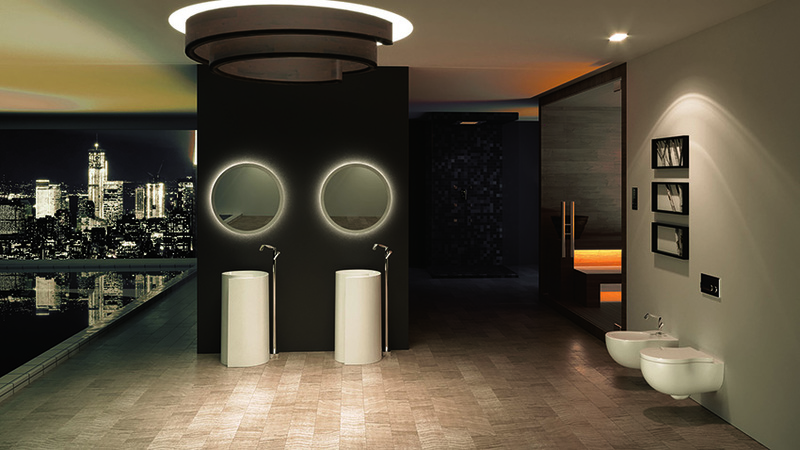 The wash basin units and mirrors with LED lighting from the Frame collection create an elegant atmosphere in bathrooms. The soft-close drawers are fitted with grey non-slip mats inside and are offered in black, white oak and taupe colour options. 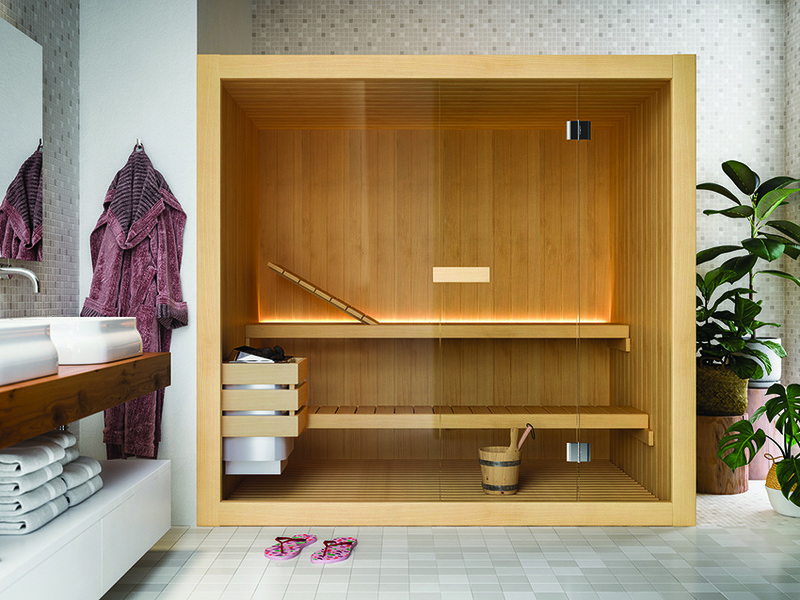 The series also includes a vanity basin, built-in mirror cabinet and a bathrobe unit. 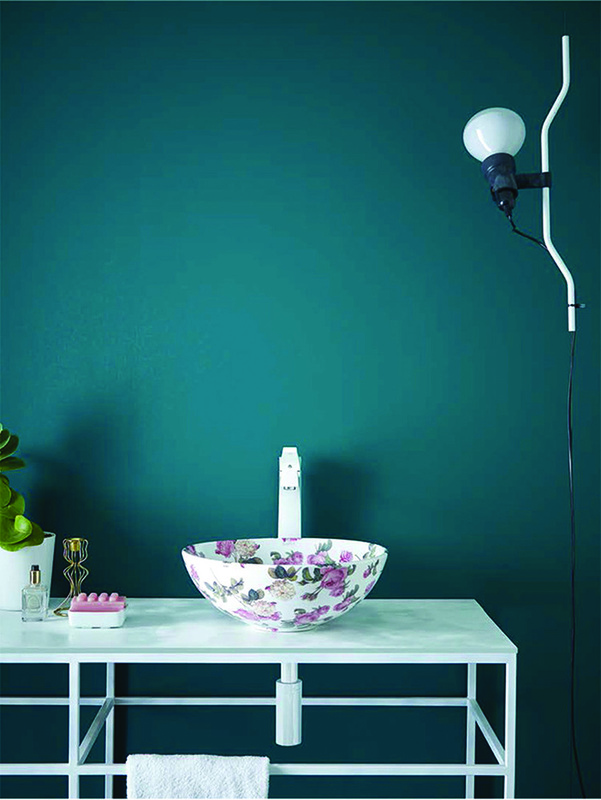 Celebrating the beauty of the rose is the Floral washbasin from the Vintage & More collection of Bathco. Handmade in white porcelain this stylish decor piece has an overall floral patterns in soft pink, beige and green hues. 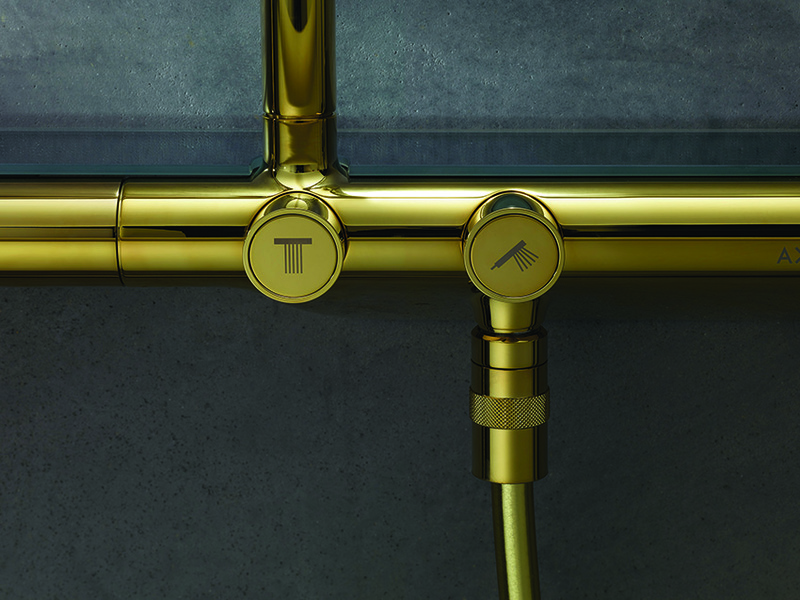 The new Metropol Classic mixers boast of elegant, gold accents on the base, handles and spouts. The Metropol Classic three-hole mixers are available in three versions: with a softly curved lever handle, a minimalist zero handle and ergonomically rounded cross handles. 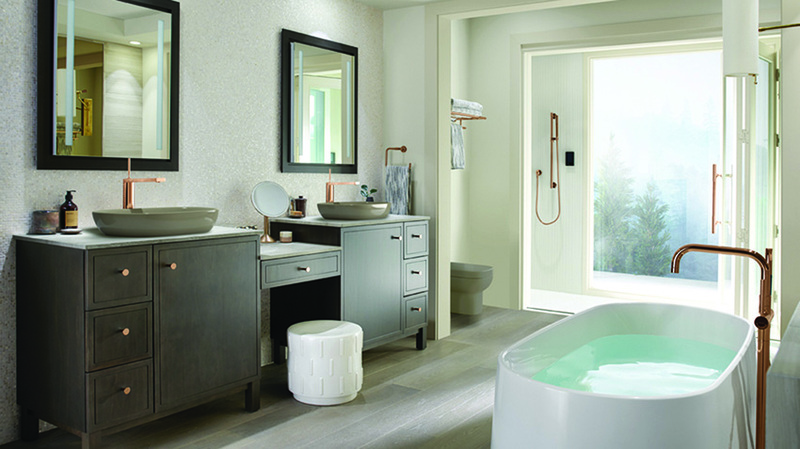 For freestanding bathtubs, there is a floor mixer with a matching chrome and gold baton hand shower. 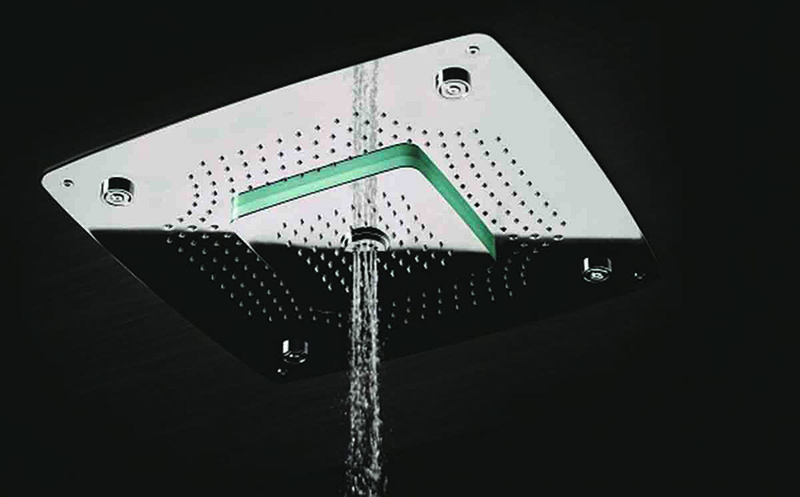 The SmartControl shower system comes in two new versions. The first combines the benefits of concealed and exposed shower systems: the water pipe is neatly hidden in the wall but the shower control unit remains accessible. The second version is concealed featuring a low-profile minimalist design and push-and-turn buttons. These are available in square and round designs as well as in chrome and white finishes. 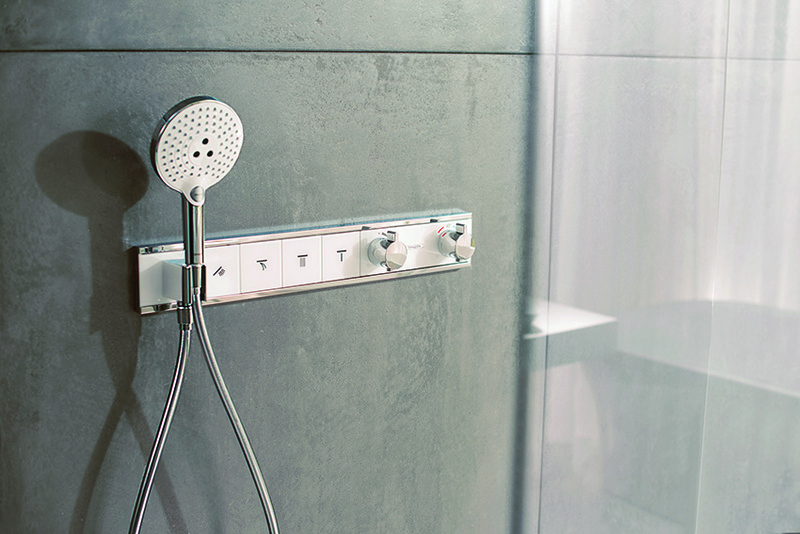 Showertronics iV6 by Artize is an experiential and intuitive electronic thermostatic mixing system that is designed to provide an unmatched showering experience. One can choose the shower mode, control the temperature and manage water flow with a simple touch of the fingertip on the highly-durable waterproof touchpad. The Tephi Bathtub and Sink is crafted entirely from Sleek-Stone, a new, technologically advanced material that combines dolomite marble with a unique resin, to create a solid compound that has the same appeal as natural stone. The Sleek-Stone is warm to the touch and offers UV-resistant properties, making the surfaces easy to clean with minimal maintenance required. 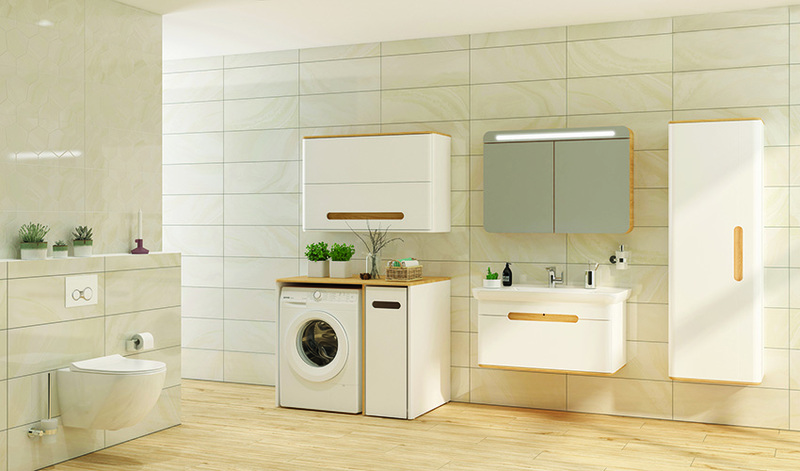 The range is available in gloss or matte white finishes. Combining the hydro flow design with the best aqua pressure, Artize’s Rainjoy+ provides soothing sensations with every shower. 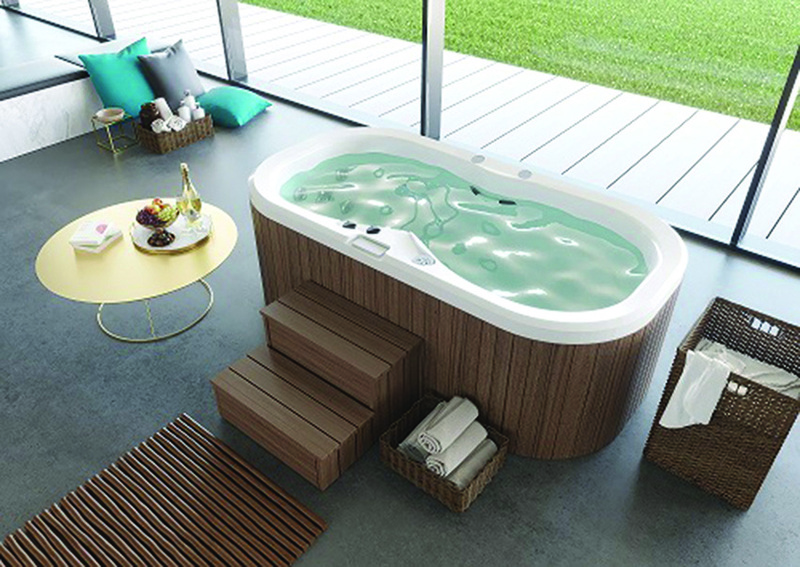 Manufactured in oval and square models, it comes with varied modes like Rain, Intense, Massage and Mist. It also features Chromotherapy lights which can be controlled by a waterproof, cordless remote that lets you pick a relaxing colour or switch to an energizing, pulsating, multi-colour experience. The SO mixer features two handles — on the left is a smaller and taller handle to set the water temperature; and on the right, a larger shorter handle that regulates the flow rate. The faucets are available in six galvanic finishes: chrome, black chrome, brushed black chrome, brushed nickel, gold and brushed gold; with handles in grey concrete, dark wood or light wood. 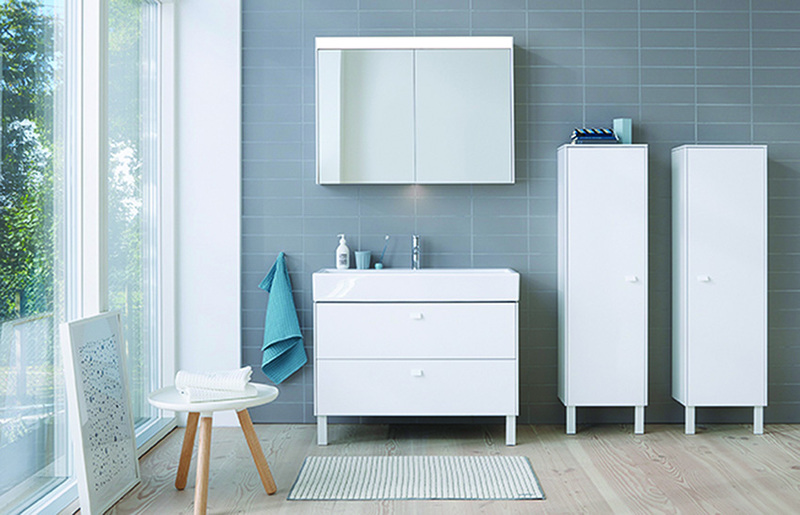 The Sento series of bathroom furniture is designed in the Nordic style and includes a washing machine unit with a closed cabinet, a laundry basket and shelf, an upper unit with drawer and shelf details along with air vents inside the cabinet to prevent humidity. 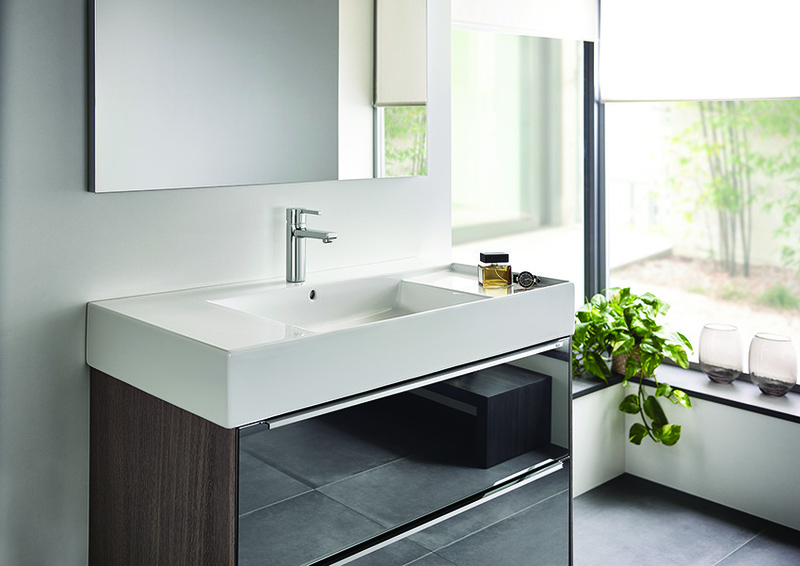 Sento also offers washbasin units with door, and single and double drawer options in different sizes and colours as well as large and deep vanity basins. Veer from BluBleu is a complete collection designed by Bullo Design Group and is made of Corian and various other materials such as Ecomalta and wood. 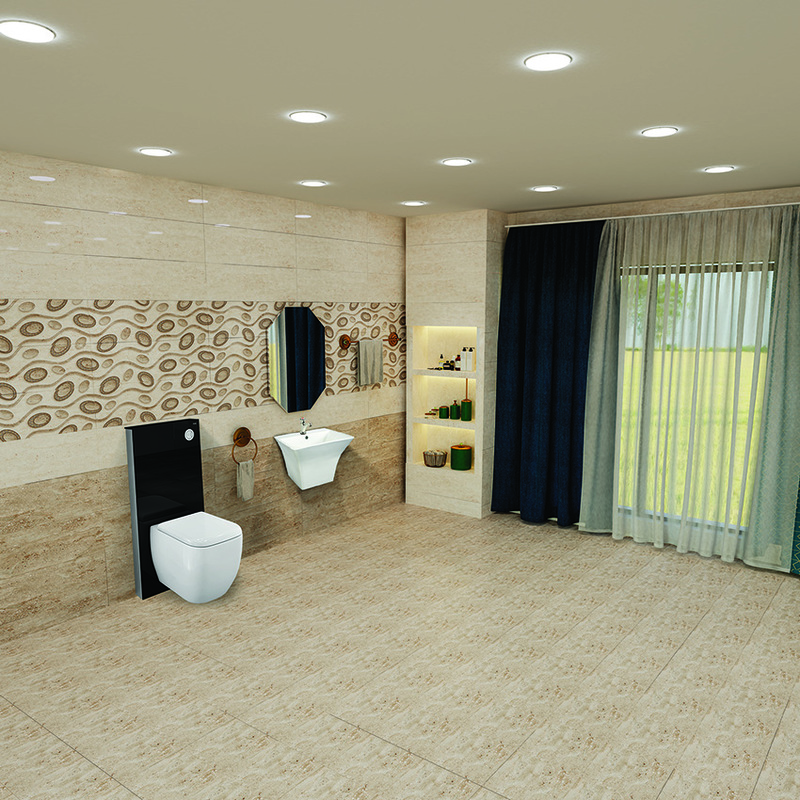 It consists of bath, washbasin and column. Veer can be personalized as regards dimensions and finishes. 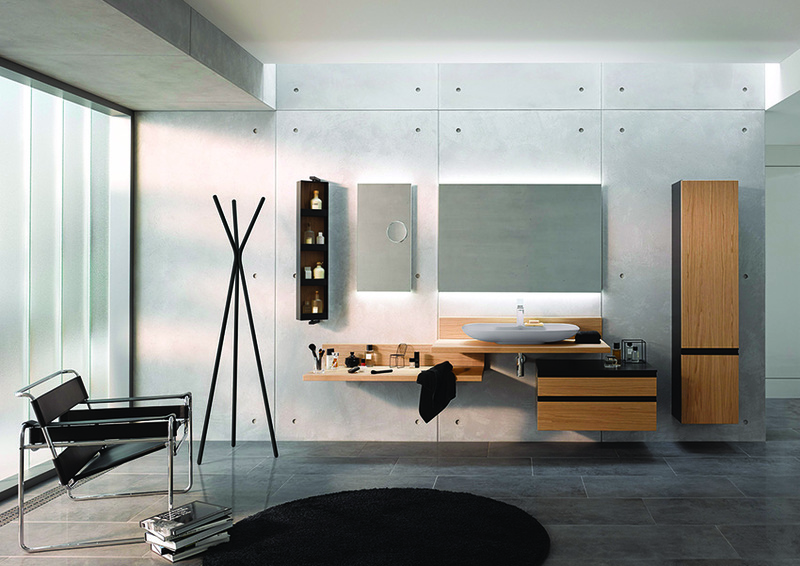 Developed around a simple wooden frame, Expo bathroom furniture is a creation by Studio Nespoli e Novara. The chest of drawers, made of wood, provides considerable storage and the option of a set of practical dividers. The mirror too is circular and made in wood. The collection is completed by a set of hanging wooden shelves with a design that resembles a ladder resting on the wall. A perfect blend of design and functionality, the urinals from the Gap range has been designed by Venice-based industrial designer Antonio Bullo. These compact wall-hung urinals come with a back inlet water connection that are compatible with urinal sensors. The elegant and refined style of the wall-hung vitreous china basin and full pedestal from the Gap range conveys a sense of serenity and peacefulness associated with the classic atmospheres of bygone times. 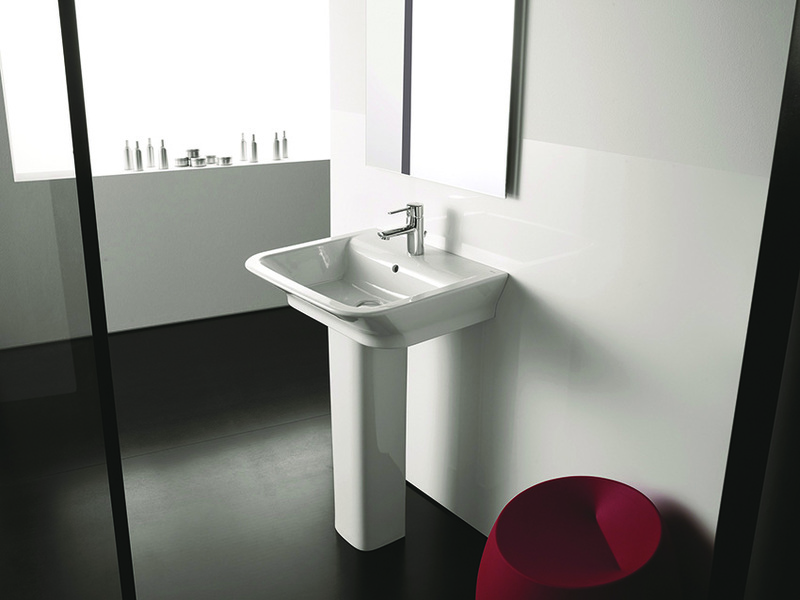 The basin and pedestal come with a stunning white finish and are durable and easy to use and maintain. 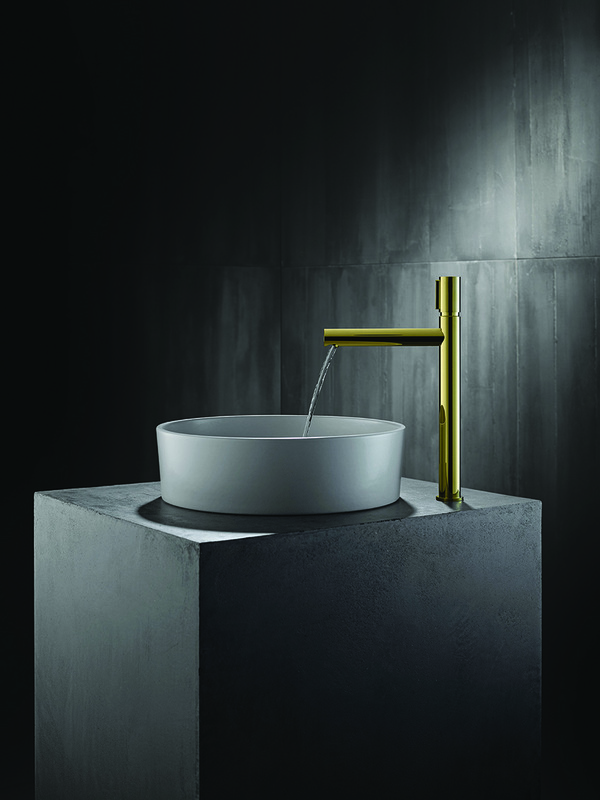 Square and cube shaped, the polished Qubic collection of faucets and shower systems are manufactured in emptied brass, with a minimum level of nickel and lead, and realized in compliance with all drinking water regulations. 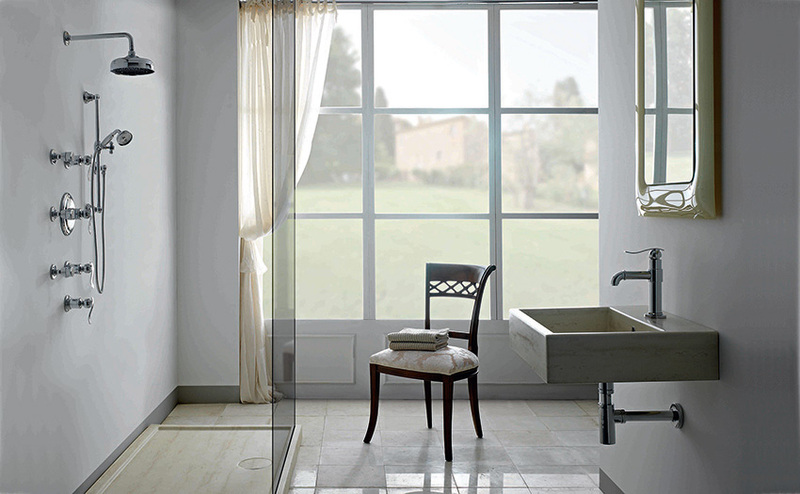 The range — available in polished chrome, Steelnox (satin nickel), black, and white — creates a cohesive bathroom suite. Created in collaboration with Phoenix Design, the Montreux range is reminiscent of the archetypical design of the first industrially manufactured bath fixtures. This 2-hole bridge mixer with cross handles is pieced together from individual elements. It comes with porcelain inlays and authentic lettering. Part of the Vignette collection, this faucet is available in a wide range of sparkling metallic tones and finishes, including matte pure gold and gloss steel. It is composed of the finest grade of stainless steel making it tough, corrosion-and scratch-resistant and maintenance-free. The F-Courbe Collection has been designed by Oki Sato and Lorenzo Damiani. 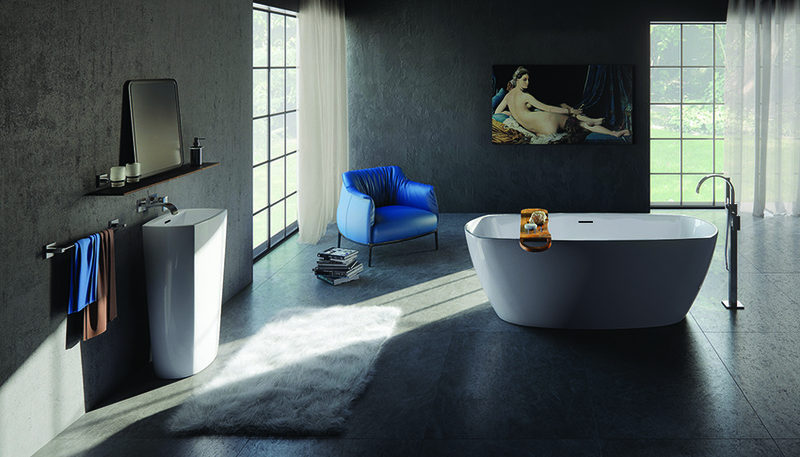 With the name meaning curve in French, it adds a dramatic turn to your bath space, giving an otherwise placid surrounding a sudden artistic distortion of form. The free standing basin featured here is available in dimensions of 44cm x 45cm x 85cm. Featured here is the concealed cistern which is covered in toughened glass and mounted on a galvanized frame which can hold up to 400kgs of weight. Note the new wall hung closets which come in both black and white hues along with a matching flush plate. 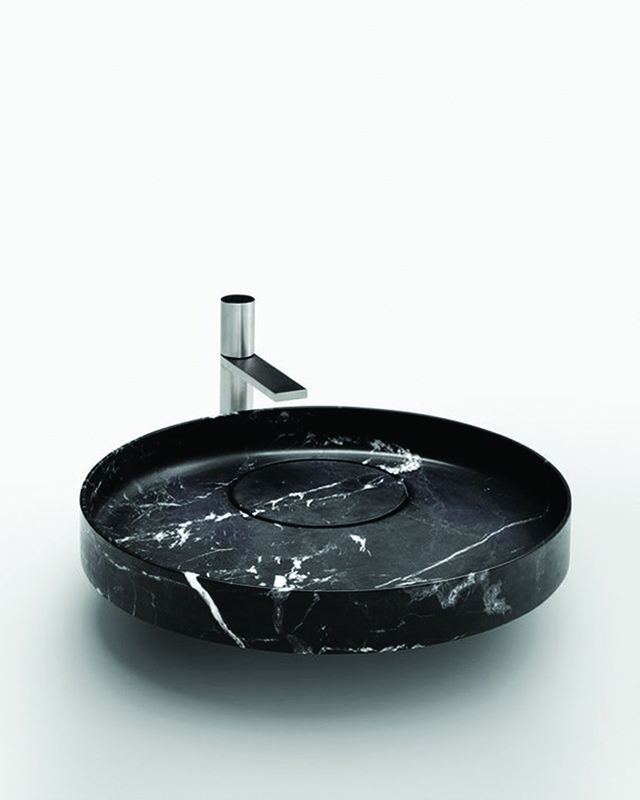 The integrated basin seen here is a single piece design has seamless finish. 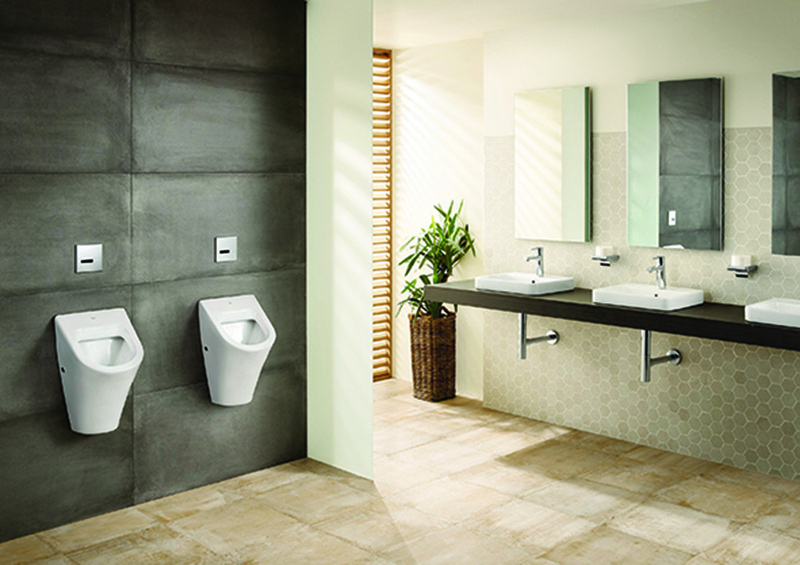 The brands rimless Hidden Fixation Commodes are hygienic as they are dirt and germ-free, easy to clean, has silent flush and also saves water. The Axor Showerpipe 800 is an impressive sanitaryware model with an overhead shower, baton hand shower, shower thermostat, shower hose, shower holder and glass shelf. It is equipped with a control system, a water guiding system and a PowerRain jet. 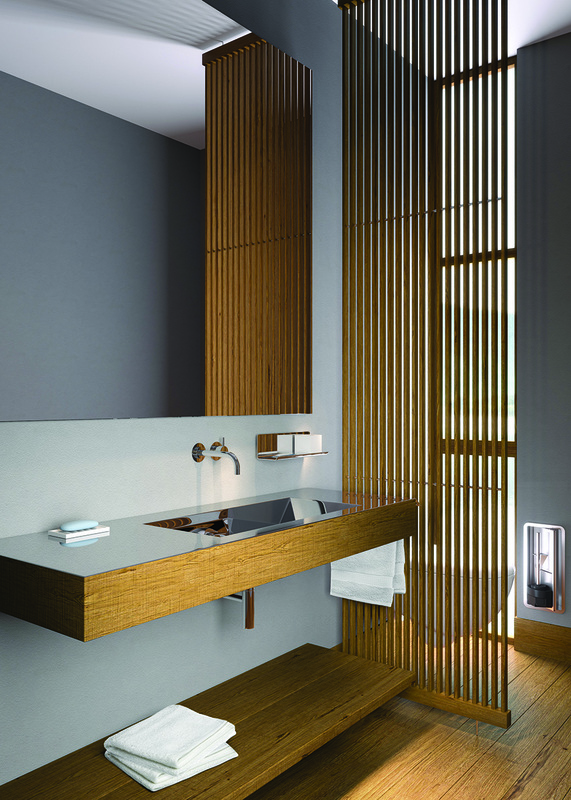 Novanta from company Componendo is a bathroom console that expresses the simplicity and refined elegance of the union between wood and steel. The steel is protected from a special anti-touch treatment against the traces of hands and drops. The woods used in this collection are: Slavonian Planed Oak, European Maple, Mahogany Sipo. The steel can be both glossy and brushed. Manufactured using PVD technology, this state-of-the-art basin faucet from the D’or range is a fusion of elegance and style. It is available in two colours: rose gold and rhodium black, and has a warranty of 10 years. 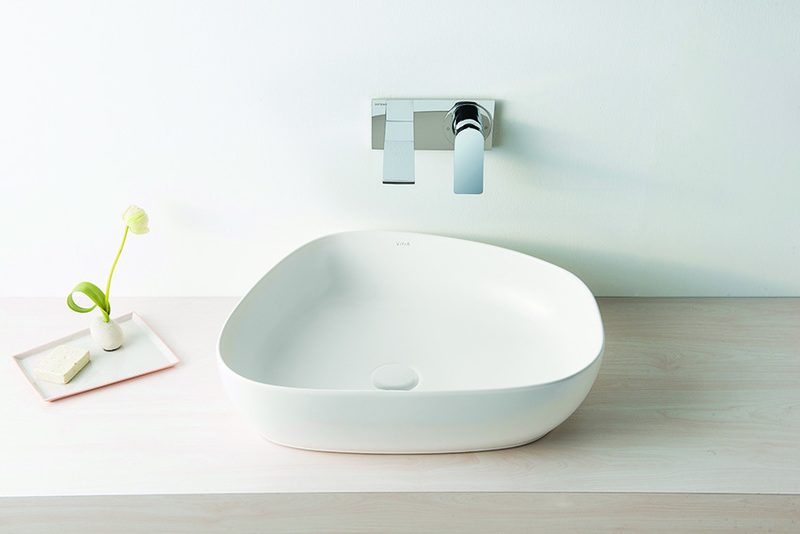 This pristine white console washbasin marries the classic and contemporary together to make a striking product. Crafted from fire clay, these easy to install beauties are sleek and sophisticated and will surely get you a ton of compliments. Available in sizes: 1,000mm x 490mm, 800mm x 490mm, 1,082mm x 605mm and 845mm x 575mm. 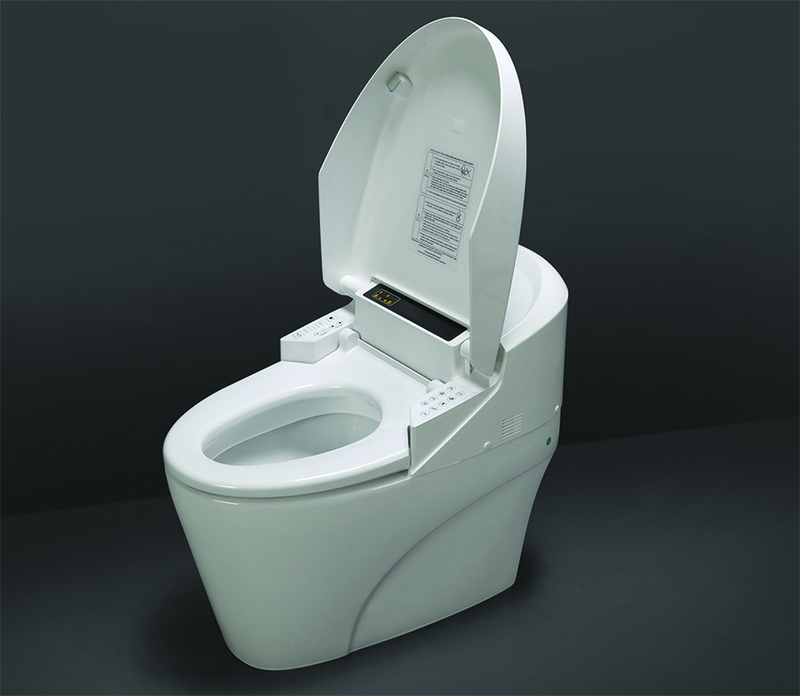 The intelligent Evita i-Gen toilet comes with features such as smart seat rim with temperature control, warm rear wash, automatic opening and closing of the lid, user-defined energy save mode that saves water through efficient flushing and powerful water flow and a fully customized remote control. 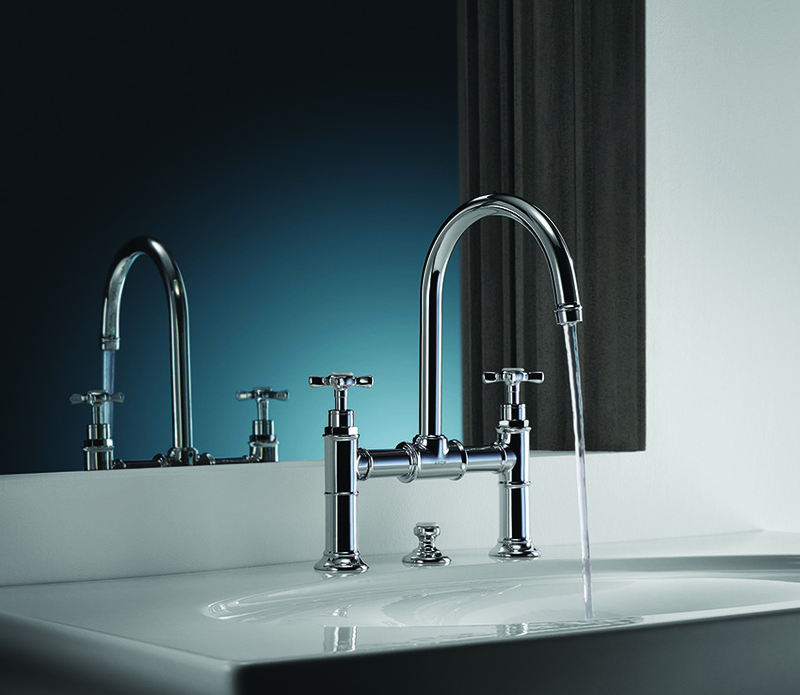 Naia range of single lever faucets are designed in cylindrical and square geometric shapes offering a seamless blend of character and sophistication. The mixers are available in four heights ensuring its adaptability to all type of basins. The ceramic cartridge is equipped with cold start technology, which offers the convenience of cold, mix and hot water gradually. 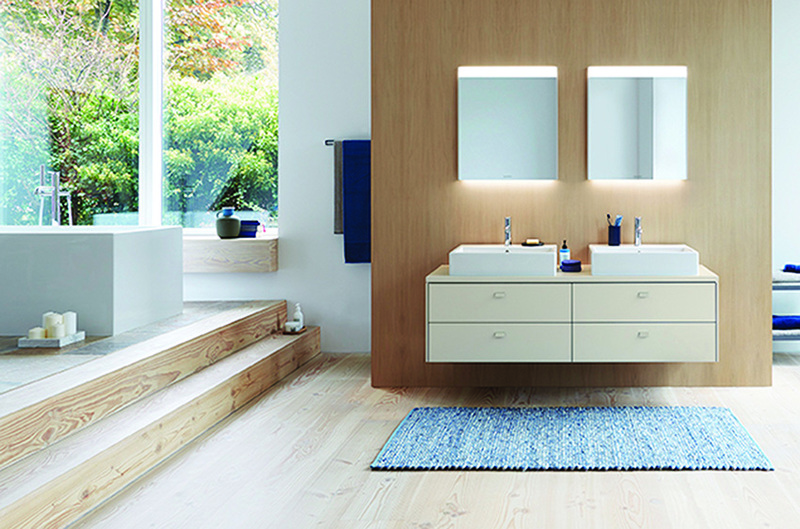 The washbasins from the Outline series are made of cerafine ceramic and come in different forms — oval, square, pebble (featured here) and round. They are available in various colours such as matte black, matte mink, matte taupe, matte white and white. 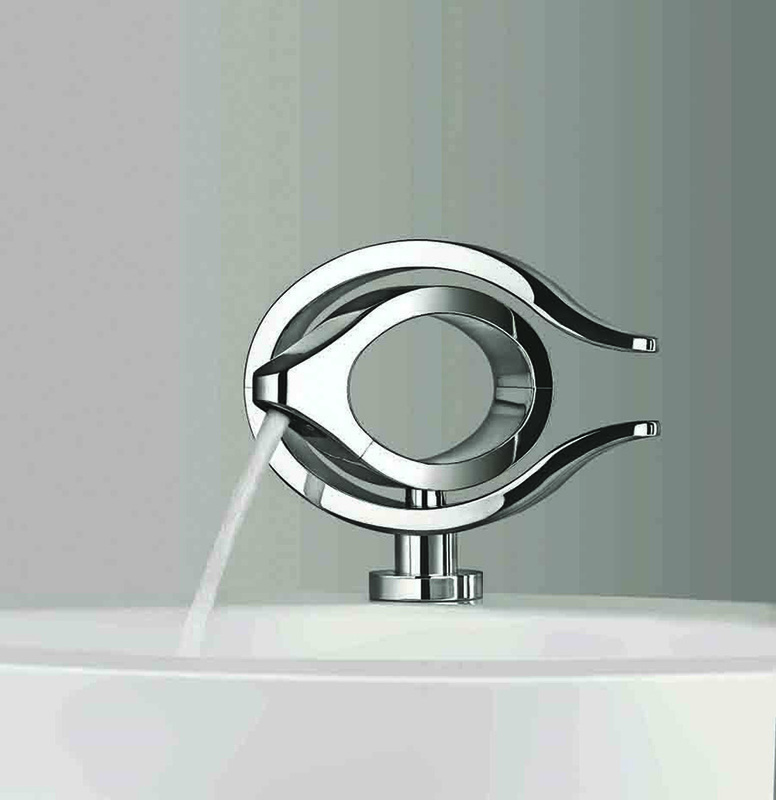 The Bali range of faucets and shower systems draw inspiration from traditional water pumps. Whether in the single-hole version, or in its widespread or wall-mounted models, Bali retains its unique ties to both the past and the present. The single lever basin mixers, the wall-mounted hand shower, wall-mounted basin mixers and shower heads are available in polished chrome, antique brushed brass, olive bronze, Steelnox and antique copper finishes. 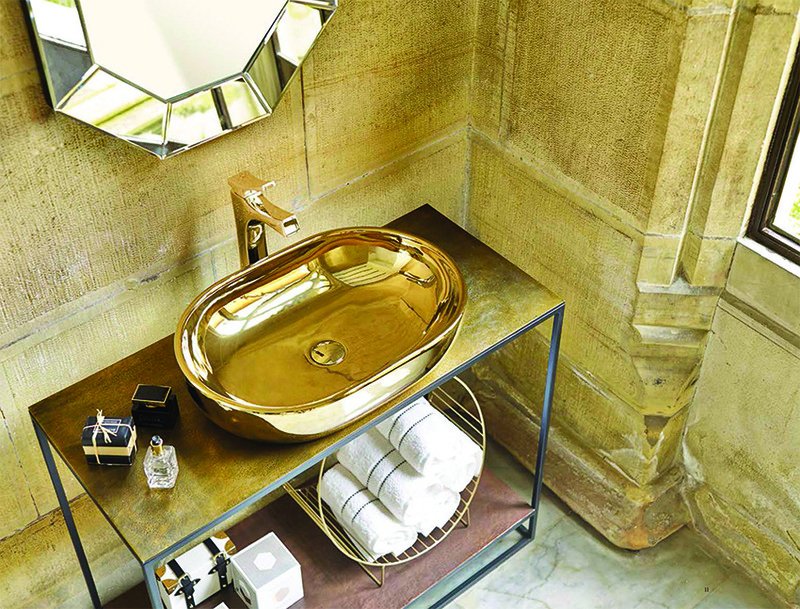 Made of ceramic, the gold wash basin from the Pent collection is an epitome of modern urban aesthetic. Manufactured in size 480mm x 480mm x135mm, it has a satin and gloss surface. 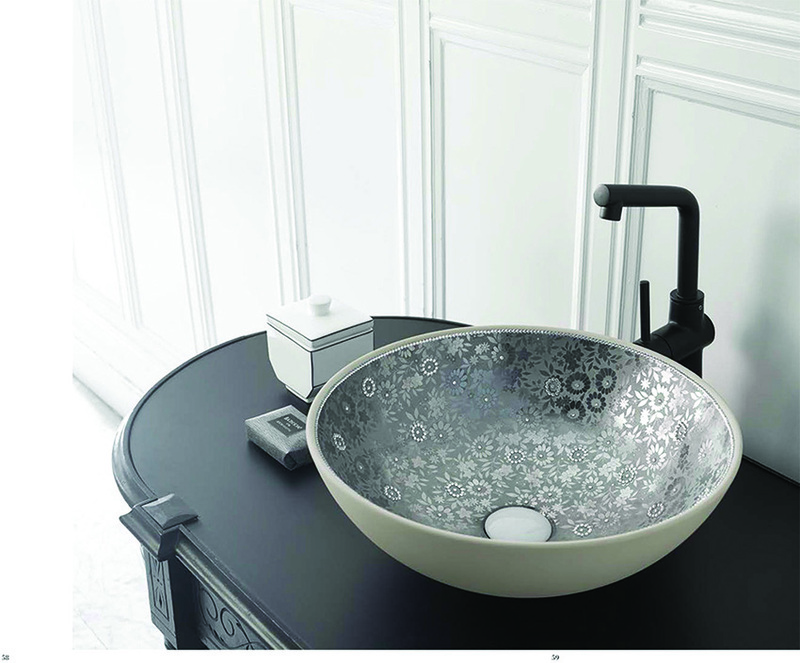 The basin is also available in white, black and silver colours.